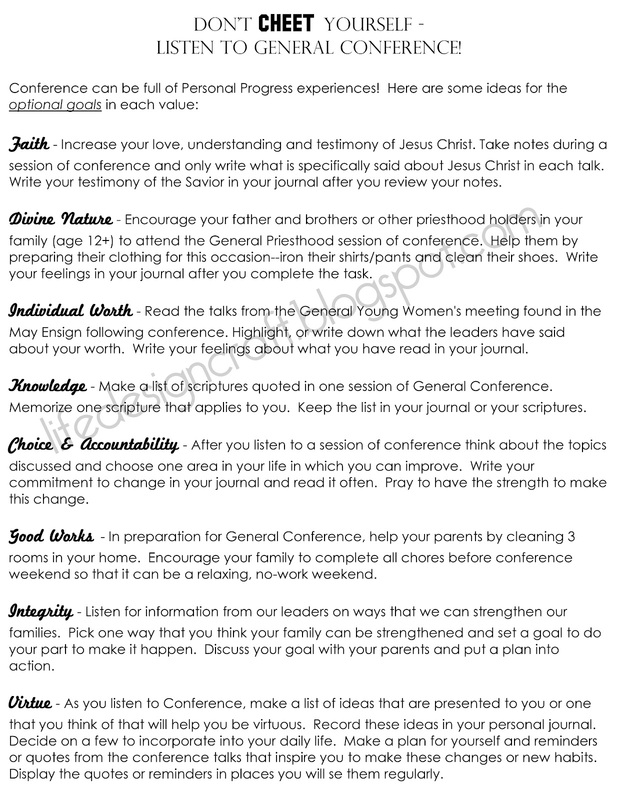 I have always taught a General Conference themed lesson the week before conference to get the girls geared up and minds focused on the importance of it... This year, I planned a lesson based around CHEETOS. Yup, you read right. Cheetos. 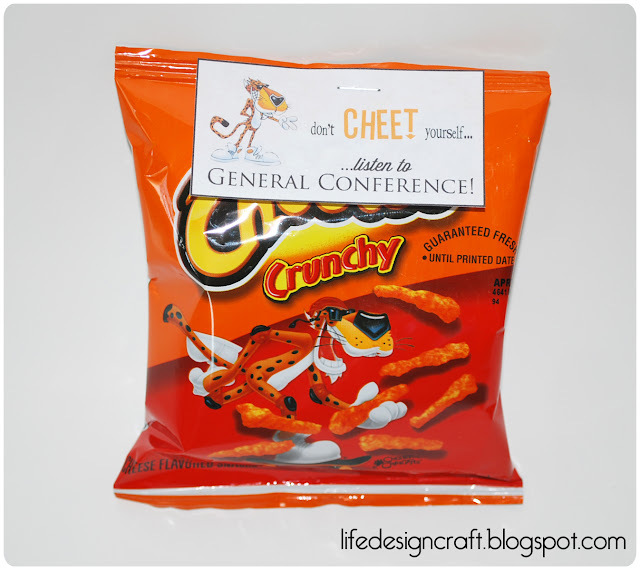 I found this fun idea for a conference treat over at Sugardoodle, my FAVORITE site for all things YW. (The idea was originally from Ondrea Slade) and I developed it into the following lesson. Q: Why would not listening to general conference be considered cheating? Allow girls to think on this....and answer if they can. · Think about cheating at school. It's against the rules, right? Why? School is there to help us learn...cheating gets around learning. · What are the downsides to cheating? not learning; if you get caught, you’re in trouble. So, let's compare cheating at school to cheating at General Conference. We are instructed to listen to prophets and apostles so we can learn about the gospel. 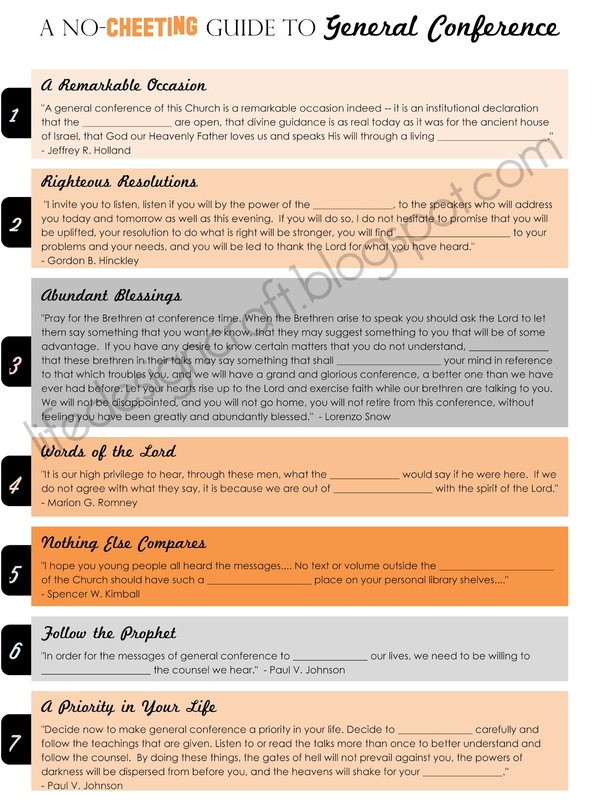 If we “cheat” by not listening to conference.... not only are we held accountable for those things taught in conference, we also cheat ourselves out of great blessings that come from living in ways taught by the prophets and confirmed to us by the Spirit during conference. We are risking our salvation by not taking the messages of the Lord's prophets and apostles into our heart and applying them to our life. To help us not "cheet" on this weekend's General Conference, we’re going to study up on some things we should know about General Conference. For the conclusion of the lesson, I will ask the girls to bring out their Personal Progress books and find which values they still need experiences for (specifically the optional "create-your-own" experiences). 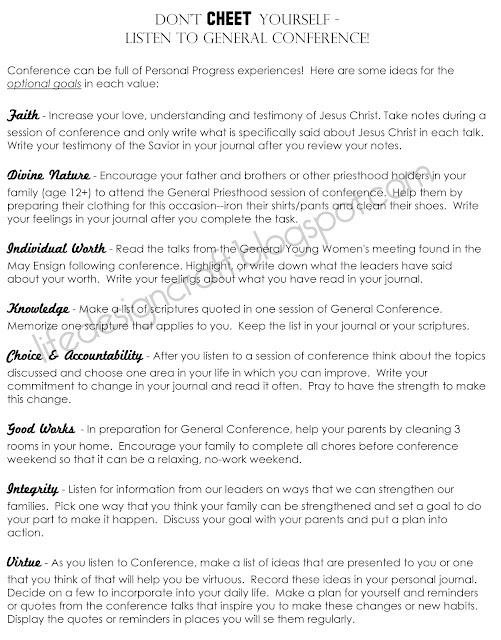 I will ask them to choose at least 2 of the below experiences to complete during General Conference. Finally, as I have done in year's past, I will give them the General Conference Youth Notebook designed by Melanie of Sugardoodle! You can download the packet for free HERE! 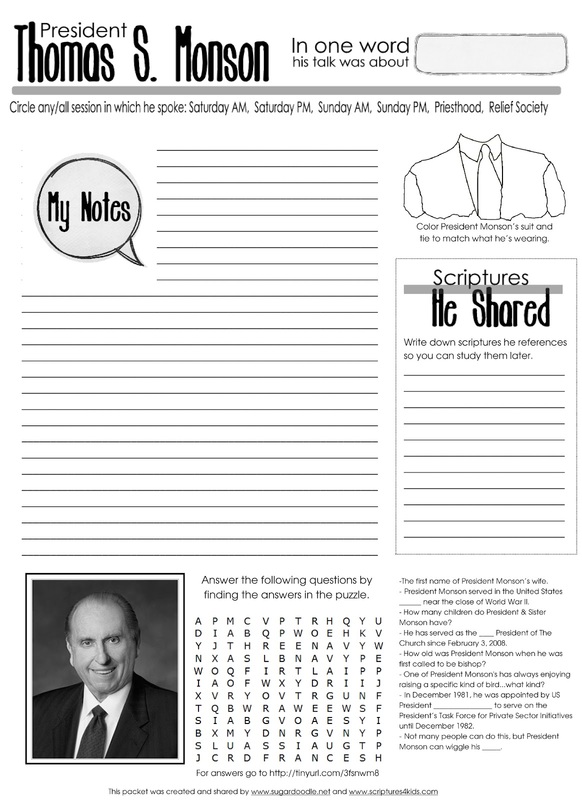 It helps the youth pay attention and gives a "notepage" for each speaker with prompts, puzzles, pictures, and other fun stuff to keep their focus on conference! I love your idea! It would be a awesome FHE lesson too. Thank you so much for sharing your gifts with us! why do you make us login? Why make it so hard? why not just let us download it? Actually, it does make you either login or create an account. I just went to Sugardoodle and printed it off. These are super cute, thank you! Real quick, when I go to download it (which by the way you're right you don't need to log-in to do it, I use 4shared all the time)before my computer opens it it tells me the file may contain a virus. I tried downloading it anyway and my anitvirus software block it saying there was an attempt on my computer. Any chance you can email me the docs? Or upload them to google docs? I'd love to use this for my activity tonight. I know I'm so last minute! fabricenvy@gmail.com Thank you again for all your cuteness! Okay, just to be 100% I went back & checked everything. I'm super bummed because I have always used 4-Shared and they've always been great! But now it seems everyone is having trouble! I'm looking into Google Docs right now and have included download links to that for a couple of my recent posts. I'm hoping that will be more user friendly! Your helpful insights and appreciative comments are always nice to read! Thanks for your patience and for following my blog! Hey! LOVE this!! I'm trying to print the tag because I'm going to buy a BIG bag & give it to the sisters I visit teach. I'm unable to print...do you have any ideas? Thanks! This is such a good idea, I too tried to download it and it says some of the files are missing or deleted...any suggestions? ?